For your first zync, turn field-level merge off. Field-level merge can make first syncs slower than normal, so while you're testing, have it off unless you have a lot of container fields. Then come back here and learn what field-level merge is all about, and when it can make your syncs faster. This is an optional setting on the Zync Options tab of GoZyncHosted (select a layout on the Dashboard, then click "Integration & Options" and you'll see a tab for Zync Options). When this is turned on, GoZync will only send the fields that have been changed since the last Zync, instead of sending the whole record. 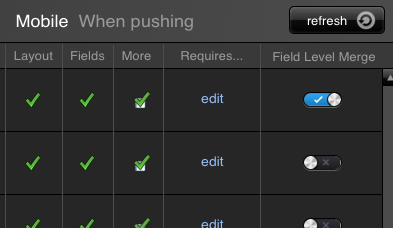 This can be a huge help if both the mobile user and hosted users are editing the same record. If you edit someone's phone number, and I edit their name, field-level merge lets both those edits get to the same record. Or imagine that you have a collection of photos about a building on your iPad. Without field-level merge, editing the caption of one photo would cause all the photos on that record to be sent up to the server: with field-level we only send the caption. We have some notes on this under the heading "speed", but field-level merge can also make your Zyncs much faster, as there is less data being sent. This is especially true with photos, if you're only editing some of the photos some of the time. Field-level merge has its own overhead, so while it can really speed things up, it only does so in some cases and is less useful (and slower) on the Pull than on the Push. Read more on this here: speed.